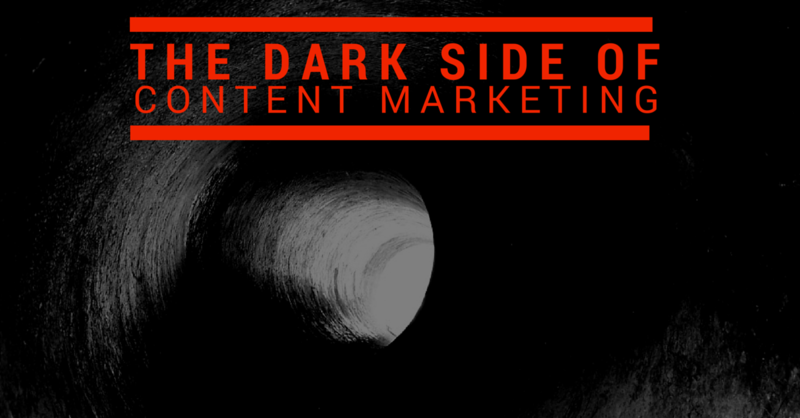 I love Content Marketing – but there is a dark side to it. A very dark side. I realized this back in 2013 when I came back from a funeral – and had the unpleasant experience to read about Angelina Jolie’s double mastectomy. How exactly are Angelina Jolie’s breasts related to content marketing? Well the connection is more visible than you might have imagined. How exactly are Angelina Jolie’s breasts related to content marketing? We content marketers claim that we are the new and better form of marketing – supporting this bold claim with statements like “We make the partner of your future clients.” We like to believe that by giving out vital information for free we make our clients influencers in their target audience. That we are creating a bond between our clients and their clients. And sometimes we are just the lying bastards – like any other marketer. But we are better at hiding the truth behind words. To give you a better understanding of what I mean I need to tell you a story. A while ago Angelina Jolie made the headlines by having her breasts removed and replaced by artificial breasts for fear of cancer. Whatever you may think about it – doing this publicly probably wasn’t easy. And she probably did what she thought was right. Right to educate people world wide about the possibilities that today exist to prevent certain forms of cancer – especially when your genes determine you are in a group that has a very high risk of getting cancer. She wrote a public piece in the New York Times on the reasons that led to this step. Shortly after she published her story I came back from a funeral – someone I knew had just died of cancer. I got into the office, sat down and opened my laptop. As cliché as this may sound, the first thing I did was open Facebook. And there the connection between my personal experience, content marketing and Angelina’s breasts looked at me with a laugh that even Heath Ledger as the Joker couldn’t have pulled off. Now I’m not a doctor but neither was the author of this piece of… I won’t go into what is right or wrong in cancer treatment. But what the article propagated was shameless – cancer is not a thing to take lightly and not all forms of cancer can be eradicated by “choice of the right foods and supplements”. Which was what this article propagated. And left Facebook for the day. Ok, I should have seen the following coming – but hey, somebody had to say it. I really should have stopped there, I know. But who else? This site was promoting in a pseudo-scientific way all the natural healing methods it was also promoting in the article. The site looked professional – had a really scientific feel to it and wasn’t even selling anything directly. The main idea of the site seemed to be to promote certain “Researchers” names. Now – don’t get me wrong – I’m not against natural healing, natural medicine or whatever. But when you claim to be able to heal cancer you better have something real. This simply wasn’t – but what it was was excellent content marketing. The main argument was that cancer inducing genes can be suppressed by the right choice of food and food supplements. And healthy living in general. Angelina Jolie had been tricked by the cancer industry into believing that she would die of cancer if she wouldn’t have her breasts removed. The cancer industry was always promoting the most expensive treatment and not what is best for the patient. Sounds like a conspiracy theory? Well, it is. But it’s clever – it gives a lot of room for half-truths and tongue-in-cheek arguments and what is most important: It allows the author to completely circumvent the most important tool of medical research: Statistics. If you were scared of brain cancer, would you cut your head off? It also used some existing problems as arguments for its purpose: For instance the too expensive health care sector. Depending on the country you live in that can be a very real problem for you, especially when you have an illness like cancer. It wasn’t just this article – the whole site was stuffed with this kind of thing. This wasn’t just excellent content marketing. It was near perfection. And it’s probably killing people, right now. It was near perfect #contentmarketing. And it’s probably killing people, right now. The ideal market for content marketing. Why? The competition isn’t selling to the end customer directly but to experts (namely doctors and hospitals) and therefore not competing with different information. The group of distributors and experts (doctors and hospitals) educate at the specific time when someone becomes ill and for some widely known risk factors like smoking, but not for specific risk groups like people who are at a high risk because of carrying a specific gene. That makes the target audience an ideal target: They are scared – but unable to find better info than the info you give them. And when you are willing to go via dead bodies, there is a lot of money to be made. The trick that is being pulled off there is a bit as if the tobacco industry sold cigarettes as a natural way to heal cancer. That is the dark side of content marketing – we claim that we make our clients the partners of their future clients by giving out relevant information. Often that is true. But often we don’t give out relevant info: We give out targeted misinformation that we have carefully crafted into convincing pieces of content for a specific target audience. The web allows us to publish almost infinite content and in many niches we are still without competition. 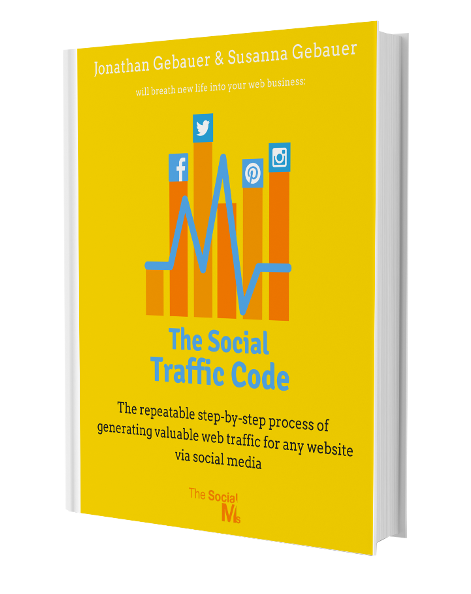 The lack of competition means we can get targeted SEO traffic easily and the target audience takes care of social media traffic. We can spread a lot of bad information for our lucky customers – and when the time comes that the competition wakes up a lot of people have died. And that is all because we are… well, we are simply good with words. In Germany, there is currently a political movement called PEGIDA (Patriotische Europäer Gegen die Islamisierung des Abendlandes – Patriotic Europeans Against the Islamisation of the Western World). As you might guess – this one is a movement that is primarily against Islam. But they work with the same strategies as noted above. And sadly politicians haven’t got a lot to counter this movement – because they are not used to market this way. Sure, they will hold speeches in public places, but they don’t have a long term information distribution strategy. Which in turn leads to more and more people falling for the misinformation. PEGIDA organized demonstrations with 20,000 people already (don’t get me wrong – this is not and never will be a representation of what the general public in Germany wants). 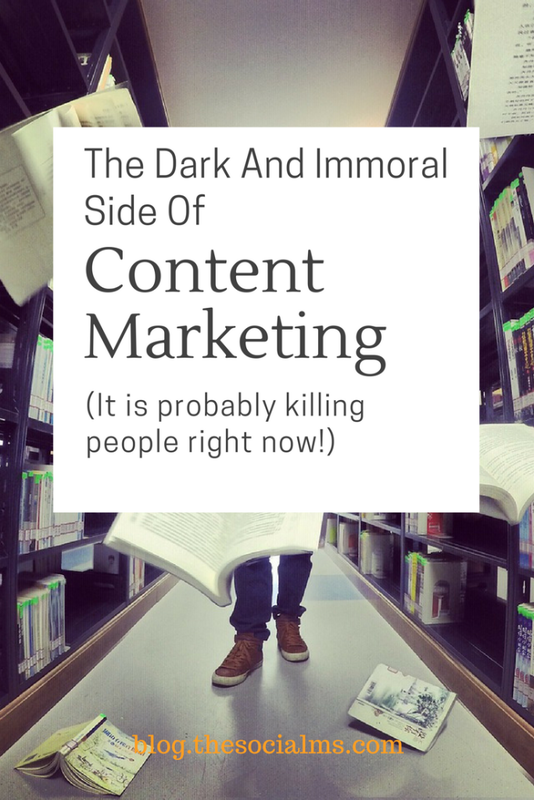 The dark side of content marketing is that when we choose to work in industries and fields that are morally questionable we can do a lot of damage. When we are willing to spread misinformation and go via dead bodies we can do a lot more damage. #ContentMarketing: When we choose immoral industries, we can do a lot of damage. But isn’t that true of any form of marketing? The question is legitimate: Marketing is done and always will be done for about anything. But – I’m talking about a highly effective marketing strategy in sectors where there is only you marketing anything because the distribution method of the competition goes via a different sales funnel. And I’m also talking about targeted misinformation of the target audience that might, in turn, lead to the misinformed customer’s death. That was always possible but current content marketing strategy actually makes it very easy – especially when you compete against the public sector. Sad End to a Sad Story? Let me finish my story from above. The Facebook thing ended with me writing a very long answer to the original post. Admittedly it wasn’t my best piece, but it got the main points across. I got a few likes by people – even a direct message thanking me for speaking out. A few days later I noticed that the Facebook stream of my friend’s wife had turned quiet for me: She had revoked our friendship on Facebook. I have not talked to her or seen her since. While not canceling our friendship the “official” way like she did – I also haven’t talked to my friend either. I guess believing cleverly spun articles and spreading them is in some way favorable to listening to the truth. That is the power of the dark side: It’s not just killing people – it’s also killing friendships when you speak out loud. Note to self: This article connects content marketing with cancer, politics, emotional personal experiences and Angelina Jolie’s breasts. If this doesn’t go viral, I don’t know what will.